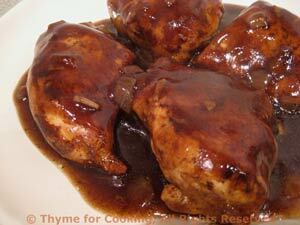 Thyme for Cooking Dinner tonight: Chicken Breasts Balsamic. I love cooking with both red and white Balsamic vinegars. I often have 2 on hand: a very nice one for salads and a less expensive one for hot dishes. They add a tangy flavor without being overpowering... Cutting it with a bit of sugar is purely optional. Fried potatoes take on a new interest with the addition of chopped onion and bell pepper. A simple dish to accompany flavorful meat or fish. Use any color or combination of peppers you have on hand. Sauté in 2 tsp oil in nonstick skillet over medium heat until just transparent. Cut potatoes into bite-size pieces (see slicing for a salad in techniques). 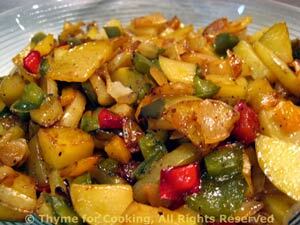 Remove onions & peppers from pan, add potatoes and remaining 1 tsp oil. Sauté potatoes until light brown and cooked through (taste one), about 15 minutes. Another of those fleeting spring vegetables. They cook quickly and are more versatile than 'just for stir-fries'. If they are small, leave them whole. If they are large (2", 5cm) cut in half of thirds, at an angle. Heat oil in nonstick skillet over medium heat. Add shallots and sauté until browned, reducing heat after 10 minutes, about 20 minutes total time. 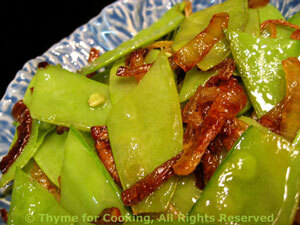 Add pea pods and sauté 5 minutes, depending on size, stirring frequently.